Great news … I’m being published. 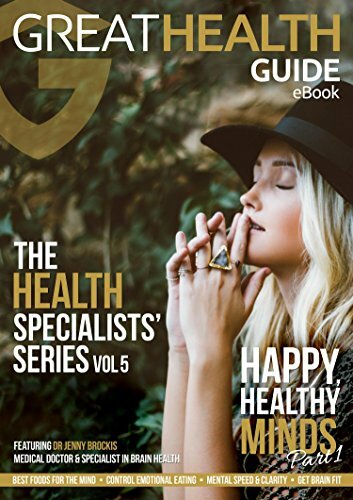 Happy, Health Minds is being launched tomorrow on Amazon with a 3-day special (only AU$0.99 normally AU$9.99). The special starts tomorrow (Saturday) morning and ends Monday night This eBook is created by Great Health Guide and is part of The Health Specialists’ Series. So yep – just facts – no fads. I would love to hear your thoughts. No matter who you speak to these days, everyone, even the dog, appears super busy, toiling away to get through their ever-growing to-do list, juggling life, family and work and wondering if they’ll be able to experience the luxury of having that little bit of time to themselves ever again. If you’re more than a bit tired of feeling overwhelmed, overstretched or just plain exhausted, fear not, help is at hand in the form of Happy, Healthy Minds. The last few decades have revealed a wealth of greater understanding of how the human brain works and of why we think and behave the way we do. But how is it possible to distinguish between the real science and neuromyth? Fake news is everywhere. Knowing what truly works to elevate mental performance, keeping us from flipping our lid, matters more today than ever before. This is the reason why Happy, Health Minds has been created. By combining chapters from a number of recognised health professionals specialising in optimum brain function and psychology, this book can help you discover what it takes to maintain your cognitive and mental well-being to always function at your very best. I’m delighted to be one of the contributors. Posted on June 25, 2017 by sharon backurz and filed under Life Coaching, Articles and tagged health life coaching happy healthy minds.